Winters kick-start the season of Amla, or the Indian gooseberry also commonly known as Awla. A peculiar green fruit that is sour and bitter and definitely not everyone's cup of tea. So why are we talking about it today? It's because this little fruit is packed with nutrients and does amazing things for your body. It's a great source of antioxidants, especially Vitamin C. It is also loaded with a range of polyphenols ( gallic acid ,ellagic acid , corilagin etc). Polyphenols are antioxidants that prevent damage from free radicals in the body and fight with different types of Cancer and Cardiovascular diseases . It is rich in fiber and minerals . Overall, this little fruit increases the body's well being and protects it from numerous ailments . Amla: A Vitamin C power house: The Vitamin C content of its expressed juice is 921 mg/100 cc, twenty times more than that of other citrus fruits. 100 grams of fresh fruit contains 470 to 680 mg of vitamin C.
What makes this fruit a Super fruit ? 1) Improves digestion: Amla is very high in fibre.Fiber adds bulk to the stool and helps food move through the bowels and keeps your bowel movements regular. This reduces the chances of constipation.Fiber can also bulk up loose stools and reduce diarrhoea It also stimulates the secretion of gastric and digestive juices, so food is digested efficiently and nutrients are absorbed in an optimal way. 2) Diabetes Management: Amla is rich in chromium which is therapeutic for diabetic patients. Chromium helps in insulin production which helps in reducing blood glucose levels. Low in sugar and high fiber fruits are perfect for any kind of diabetic patient. 3) Boosts hair growth: Amla is a very high source of iron and antioxidants which prevents hair fall by protecting hair follicles against any damage from free radicals. It also promotes hair growth and stops premature graying as well and has various hair benefits. Intake of fresh amla or using its paste in the roots of hair improves both growth and color. 4) Prevents ageing: High antioxidants prevent cells from free radical damage. 5) Reduces infections and enhances immunity: It has antibacterial and astringent properties which means it helps in increasing a person's immunity and protects the body from various infections. 6) Weight Loss: Amla purifies the body by flushing out toxins that have saturated inside the body. The presence of such toxins in body may disrupt the functioning of enzymes in the digestive system and can obstruct the digestion process. By removing the toxins from body, amla helps in proper digestion of the food and makes sure that all the nutrients from the food are absorbed in the body and the redunddant matter is expelled from body. 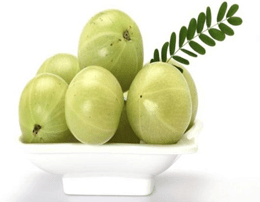 7) Diarrhea and Dysentery Due to its strong cooling and laxative properties, Amla is a useful component in remedies for diarrhoea and dysentry . It offers relief for acidity, heartburn, bowel problems, flatulence or even indigestion. 8 ) Remedy for Cough and Cold : The fruit is abundant in Vitamin C which boost your immunity and enables eradicating common cold as well as flu more rapidly. 9)Amla versus Oranges : 100 gm of amla contain 600 mg of vitamin C, 100 gm of oranges contain only 30 mg of vitamin C. The vitamin C of one tiny amla is equivalent to about two medium oranges . Thus Amla has 20 times more vitamin C as compared to an orange . Tulsi leaves :10 to 12 in no. Wash Amla, tulsi leaves and carrot. Roast the flax seeds and de-seed the amla . Grind all the ingredients in a mixer and form a paste. Add 200 ml of water and mix well . Boil it for 2-4 minutes, sieve and serve warm. l Wash and boil the Amla in a pressure cooker on medium flame for 2 whistles . Once the pressure cooker cools down, open it. Cut the boiled Amla and remove the seeds . Chop green chilies . l Heat oil in a pan add jeera , hing , meethi dana , saunf and when seeds start crackling add green chilies, haldi (turmeric powder) , red chili powder and chopped Amla pieces and cover the pan . Cook for few minutes on medium flame till amla gets cooked completely . l Serve hot with rice or roti . Wash and boil the Amla till it becomes soft . Add dhaniya and red chili powder and saute for few minutes . Let it cool, blend it in a mixture and serve . Wash and boil the Amla till they are soft. Allow it to cool and De-seed them . Grind the Amla with green chilies in a mixer .Add salt and mix well along with beaten curd. Garnish with some fresh coriander leaves .Serve with pulav or roti.